Esico-Triton has been engineering and manufacturing quaility production proven soldering equipment for 75 years and running. The high volume production Model 36 is a 250W, 120V soldering pot. Excellent for dip soldering individual small components and wireleads. These pots are proven for today's continuous production requirements. Whether tinning, stripping or dip soldering these pots are simply impressive. 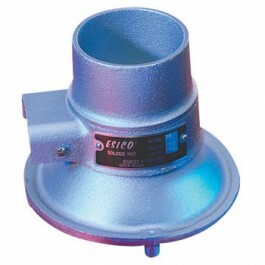 The cast iron crucibles are constructed with operator convienence in mind as well as comfort and high volume production. The Model 36 soldering pot has an inner diameter of 2 1/2", 1 3/4" inside depth and a max. temperature of 750 deg. The crucible solder capacity is 2 1/4 Lb. All soldering pots constructed by Esico-Triton come standard with a three conductor cordset. These cordsets are resistant to oil, heat and abrasion. *All solder pots are available in Lead Free and can be purchased in 240V, at additional cost. Details upon request.